This month the Port Landing at Fife Apartments Blog has shared ideas for indoor activities and ways to reflect on what you’re thankful for. To continue with this holiday theme, we’d like to share a few easy-to-make centerpieces for your Thanksgiving table. Enjoy putting together these simple yet striking arrangements that are sure to capture the spirit of the season in Fife, Washington. If you have a cake plate, then this first centerpiece is a no-brainer. All you need to do is cover the cake plate with fall-themed decor, such as fake leaves, pinecones, and squash. A good tip is to head over to a local craft store, pick up a fake pumpkin and other small items for a few bucks, and then pile them on. This is a fun and simple centerpiece that you can really be creative with. Now onto something a little more crafty. We love this Thankful Tree Turkey by Dandelion Patina. Do you have a friend that’s handy with wood? This project is perfect for them! Create your turkey today with wood, glue, and old forks. We’ve never seen this idea for Color Wrapped Wheat (by Inspired by Charm) until now, and it looks like a great centerpiece! Here’s what they have to say about it: “It’s a simple and easy project, but it’s a beautiful way to add interest and a splash of color to your Thanksgiving table. And don’t worry, even if you’re not hosting the holiday feast, you can still whip up a few of these to decorate your space.” You’ll need dried wheat stalks, embroidery floss (in any color you’d like), and a pair of scissors. That’s it. This DIY Wooden Candle Holder Centerpiece is another great-looking option for your Thanksgiving table. Again, if you or someone you know is handy with wood, it’d be beneficial to get together and work on this project! Still looking for ideas? 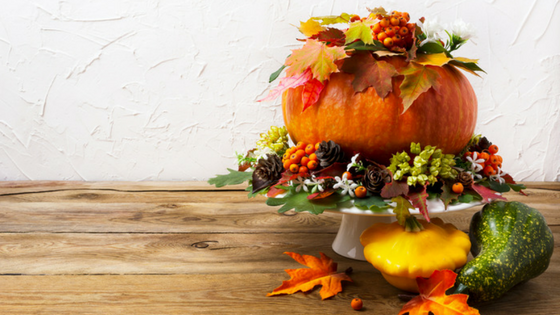 Here are over 40 Thanksgiving Centerpieces to check out! What’s your favorite centerpiece? Leave a comment below. Thanks for reading. Happy Thanksgiving!